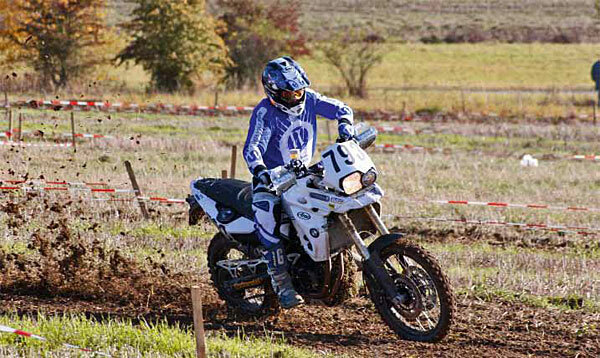 In spite of his Enduro road tires, Dirk Thelen turned in an impressive performance on his Wunderlich F 800 GS in the 57th Mid-Rhine Off- road Challenge. 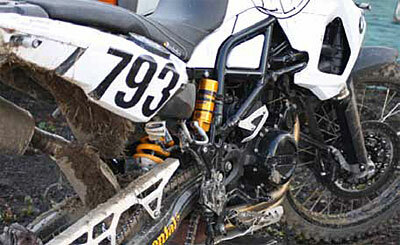 This is the granddaddy of all motorcycle events and took place for the 57th time in 2009. With 175 participants there was a pretty big starting line-up with large numbers of spectators. We’re talking about the “Mittelrheinische Geländefahrt” (Mid-Rhine Off- road Challenge). The dynamic MSC Kempenich Motors MSC invited all comers to the Brohl Valley on the edge of the Eifel, including the four-times Enduro champion Dirk Thelen. 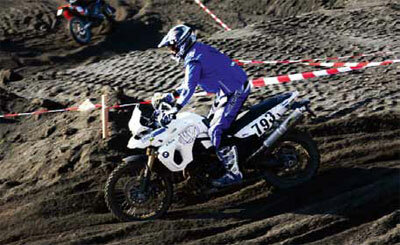 Wunderlich had prepared a special BMW F 800 GS just for this exciting event. Coming up to the race, the mood in Sinzig was one of quiet confidence. Rider and bike had been optimally prepared; everything seemed in A1 order. All that was missing was the right rear tire; that shouldn’t be a problem – or so we thought! The nearer it came to the start of the competition, the more hectic became the search in commercial outlets for a reliable and race-fit original 17-inch rear tire. The team wanted to start the race with kit as close to stock as possible. The FIM (Fédération Internationale de Motocyclisme), the race’s highest arbiter, finally forced the issue by accepting none of the proposed tires for the 17-inch rear wheel. So the people from Sinzig opted for a Metzeler Karoo, which is an Enduro tire exclusively for road use – a courageous decision when you look at the notoriously difficult off-road conditions in Kempenich. The starter’s flag finally went down. The riders had to negotiate three circuits of 48 kilometers, each of which contained two special challenges. The first of these was a stretch of some four to five kilometers in length across fields alongside the paddock; the second was a pit of sand and lava with a lot of demanding points, some five kilometers long. And of course, it had to rain heavily and continuously the night before the race. It doesn’t take much imagination to picture the state of the field after the rain. So, with his Enduro road tires, Dirk’s work was cut out for him – he spent more time perpendicular to the track than he did riding along it in the normal way, although the challenge presented by the sandpit was surprisingly easy to master. As the race went on, the course dried out relatively well and the Karoo found more purchase on the second circuit. However, it was still difficult enough to keep pace with the others with their competition tires. A minor crash due to inadequate grip cost him about ten seconds. None the less, the perfect preparation and tuning of the Wunderlich BMW made up for some of this. The third circuit went really well – the ground was offering better purchase, and the multi-time winner of the Enduro-Rallye cup was, in his own words, “at one with the motorcycle”. No more spills; everything went like clockwork. When Dirk Thelen finally saw the checkered flag that afternoon, he had achieved a very creditable 11th place, had had “a lot of fun” and was very happy with the bike. “All the extras and the BMW itself came through with flying colors. Tuning and preparation were first-rate,” Dirk Thelen enthused, obviously – and justifiably – proud of his achievement. Just as happy were the many spectators, who of course followed the performance of the Wunderlich F 800 GS with great interest and were rewarded with an exciting and varied race experience.